We LOVE glitter up here at the North Pole. Fortunately for us and all the other sparkle fanatics out there, it’s pretty easy to make your own glitter ornaments; all you need is the right adhesive. For glass ornaments like these, we recommend using Glitter It. You can try layering different colors of glitter, but this can become a little tricky, as it’s almost impossible to get perfectly straight lines. As long as you aren’t pining for perfection, you can make some beautiful multi-colored ornaments using this technique. Remove caps from each ornament. Follow instructions on the bottle of Glitter It for cleaning the ornaments. Let dry COMPLETELY. Note: If you don’t have the time to clean the ornaments, you can forgo that step. We tried glitterizing both the clean and unclean ornaments without noticing any difference in the results. 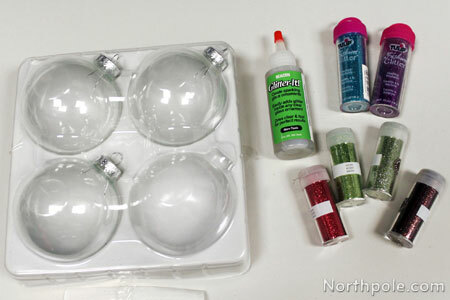 Pour some Glitter It into an ornament, and swirl it around to completely coat the inside. 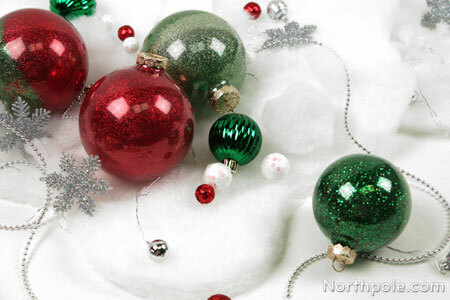 If you have some trouble coating the neck of the ornament, use a pipe cleaner to spread the adhesive. Pour excess back into bottle. Now pour some glitter into the ornament and swirl glitter around to completely coat the inside. 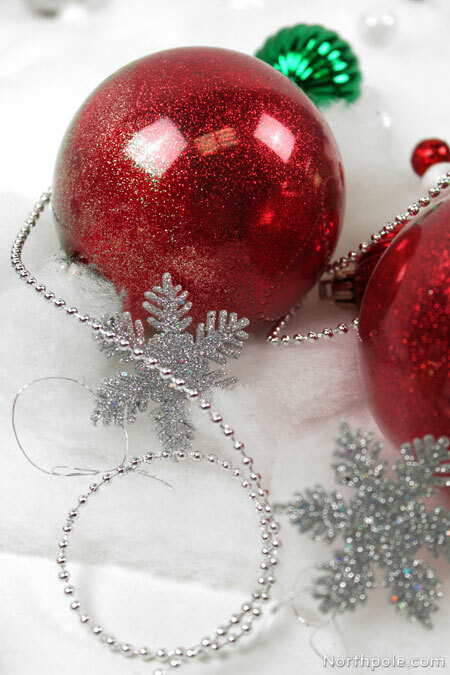 Gently shake ornament over a piece of paper to discard excess glitter. Return excess glitter to container. 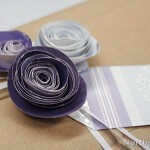 Try creating stripes of color by adding a very small amount of one color. Swirl around bottom of ornament. Add a small amount of a second color glitter; swirl around and add more if needed. Finish coating inside with a third color. The goal is to add just enough glitter to coat the ornament for that stripe so that you don’t have to dump excess glitter. �If you do try to dump excess glitter while there are exposed areas of the ornament, you will get glitter stuck in that area. You may not mind the effect that this produces and can even use it to your advantage.